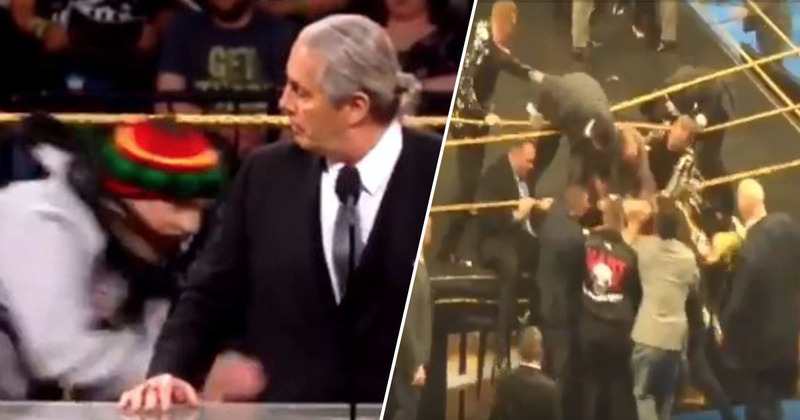 Wrestling legend Bret Hart was attacked by a fan during his speech at the WWE Hall of Fame ceremony. The 61-year-old appeared at the Barclays Center in Brooklyn, New York, last night (April 6) to be inducted into the Hall of Fame as part of the Hart Foundation tag team, along with recently deceased pro wrestling star Jim Neidhart. Hart stood alongside Neidhart’s daughter Natalya as he gave his speech, but one fan decided to interrupt as they rushed the ring and tackled the retired wrestler. Hart appeared to be alerted to the invader as he turned in their direction, but he was unable to react quickly enough and the fan grabbed the 61-year-old around his waist. The event was being broadcast on The WWE Network, who cut the feed briefly after the Hart, who has survived both a stroke and cancer battle, was attacked. Videos taken from fans at the event showed the aftermath of the situation, which saw the attacker being quickly subdued by security and several current WWE employees and superstars, including Shane McMahon, Xavier Woods, Tyson Kidd and Curtis Axel, who rushed into the ring to save Hart. Wrestler Dash Wilder even appeared to teach the stage invader a lesson as he threw a punch his way, ABC report. An over-exuberant fan surpassed our security at ringside and made his way briefly into the ring. The individual has been turned over to the proper authorities. The attacker was reportedly charged with two counts of assault in the third degree and disorderly conduct. After the interruption, Hart was able to resume his speech and the show continued as planned. Thankfully the former wrestler didn’t appear to have been harmed. Why did someone attack Bret Hart at the #WWEHOF, the man is a cancer and stroke survivor and deserves nothing but respect. I have the utmost respect for every person there who got rid of the fool. And to Bret and Nattie for carrying on. Nattie your dad will be so proud of you. You’d think fans would know better than to try and tackle a former wrestler at a WWE event.